AMMAN — Spain will act as a hub for promoting some Jordanian products in Europe and worldwide, Spain’s Secretary of State for Commerce Xiana Mendez said on Thursday. Mendez added that a Jordanian-Spanish fund will be established to finance projects in the fields of infrastructure, solid waste management, renewable energy, water and transportation. 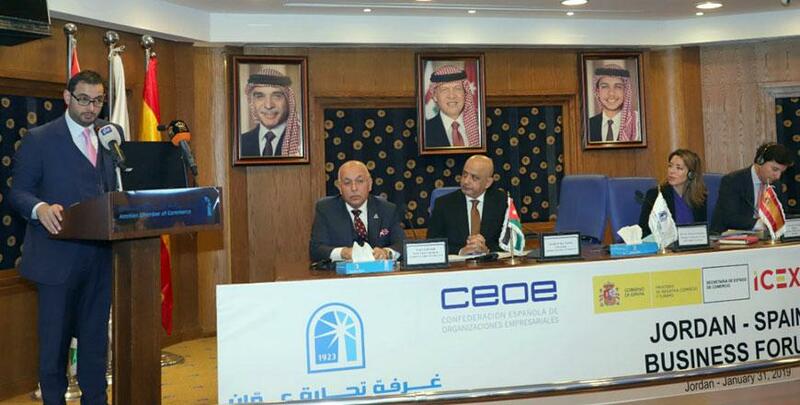 The Spanish official’s remarks came during the Jordanian-Spanish Business Forum, coorganised by the Amman Chamber of Commerce and the Spanish Chamber of Commerce, the Jordan News Agency, Petra, reported. The Spanish official called during the forum for joint economic ventures between Jordanian and Spanish businesspeople, according to Petra. She voiced appreciation for Jordan’s humanitarian assistance to Syrian refugees, pledging support from Madrid to the Kingdom’s economy to help alleviate burdens resulting from hosting refugees. Minister of Industry, Trade and Supply Tareq Hammouri said that Jordan seeks to expand investment and economic cooperation with Spain, adding that trade exchange between the two countries is “still below expectations”, with Jordanian exports to Spain reaching only around $7 million in 2017 compared with $483 million of imports, Petra said. On the sidelines of the forum, the Amman Chamber of Commerce signed a memorandum of understanding with the Spanish Chamber of Commerce to expand trade cooperation and enter joint economic ventures. Nabil Khatib, Amman Chamber of Commerce deputy president, echoed Hammouri’s remarks, saying that the Jordanian exports to Spain stood at around $16 million in 2018 compared with imports of around $330 million.